Are "touristy" areas such as Saint-Germain des Prés good places to dine? In Paris, they can be, as an evening at the Brasserie Saint Benoit proved. Outdoor dining is one of the true delights of Paris, and there are many opportunities to do so. Our first evening in Paris on a late spring visit was at La Brasserie de Saint Benoit, a block or so from the Church of Saint-Germain des Prés. Its menu looked pretty standard and there seemed to be quite a few Americans there (as well as some French families out on Sunday evening). We were pleasantly surprised with the quality of both the food and the service, and had a lovely evening. Tom started with country ham and melon, I with a warm goat cheese salad. For the main course, we both chose confit de canard—wonderful French duck leg that has "marinated" in fat for months and is then cooked, rich and delicious—with lovely small roasted potatoes and salad. Mentioning this to a French friend the next week, her horrified response was, "Confit de canard? en été?" ("Duck confit? In summer?") Apparently the French would only eat this in the cold winter months, but we enjoyed it nonetheless. For dessert we indulged our love of chocolate with profiteroles and chocolate cake. Our red wine was by the glass and pleasant, and our charming server livened up the evening by offering to let us taste the water, after we ordered a large carafe. Restaurants will often ask if you want still water or fizzy water—plat or gazeuse—but it's fine to just ask for a carafe d'eau if you just want (free) tap water. A 3-course dinner with wine for two people cost about 80€ total. That made it about $57 per person, with all taxes and tip included. That's an important thing to remember when comparing French restaurant prices with those in the US and elsewhere. In France all taxes and service are included, whereas in the US you might pay 5 to 8% in meal tax, plus a tip of 15% of more. That can make a big difference to your final bill! So if the prices look high at first compared to what you're used to, do the math and see whether they really are. 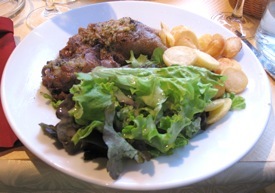 Succulent confit de canard, with potatoes and salad, at La Brasserie de Saint Benoit, Paris.